We are part of a rich historical tradition that is ongoing. 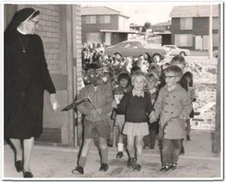 St Vincent’s Primary opened in the Jamison Community Centre and Library, Macquarie, for the first term of 1970. The move was made to the current campus in May 1970. The school was under the direction of the Sisters of Jesus, Mary and Joseph, a Dutch Order. Sister Antoinette was the first Principal. Father Reynolds was the Parish Priest. In 1975, the Dutch Sisters left the school and were followed in 1976 by the Sisters of St Joseph of the Sacred Heart. History repeated itself, however, and in 1981 the Sisters left the school due to the needs of their Order in other areas. In 1982, the first lay Principal was appointed. The school quickly became the focal point of the Parish, with the parents very active in its support. St Vincent’s has come a long way since the early days of 1900 and today it is a vibrant educational community that is an integral part of the Parish of St Mathews and St Vincent de Paul, the local community and the Archdiocesan school system.